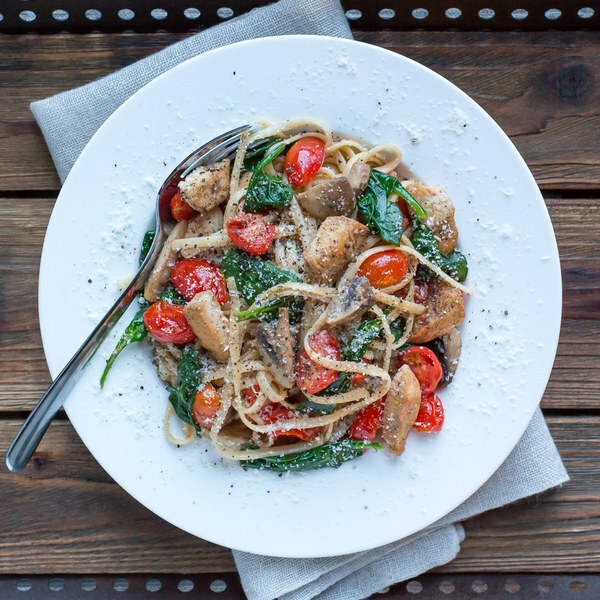 ← Chicken Florentine Pasta with Mushrooms, Grape Tomatoes & Spinach. Fill a medium saucepan halfway with water, cover, and bring to a boil. Uncover, add salt and pasta, and stir for a few seconds. Cook until desired firmness, 8-10 minutes. Drain once cooked. Wash and dry spinach. Wash tomatoes and mushrooms. Halve the tomatoes. Quarter the mushrooms. Peel and mince garlic. Cut chicken into bite-sized pieces. Season with salt and pepper. Coat bottom of skillet with oil. Add chicken and cook until browned and cooked through, 1-2 minutes per side. Transfer to a plate and set aside. Return skillet to stove, reduce heat to medium, and add more oil (if needed). Add garlic and cook until fragrant, 15-30 seconds. Add mushrooms and season with salt and pepper. Cook until tender, 3-4 minutes. Add broth and cook until reduced by about ½. Remove pan from heat. Return chicken to skillet and add tomatoes, spinach, and pasta. Toss until ingredients are mixed and spinach is wilted. To serve, place pasta on a plate or in a bowl. Enjoy!